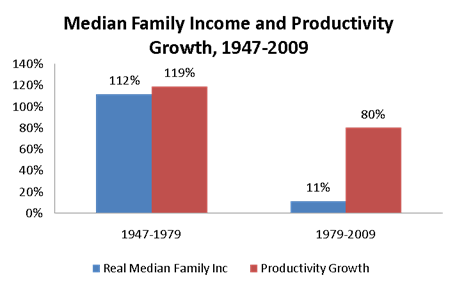 I’ve been working on explaining pictures like the one below, trying to understand why middle-class incomes so dramatically stopped tracking productivity growth. Productivity gains are society’s main path to improved living standards, but if those gains elude the middle class, it’s not a reach to say that the glue holding our society together starts to weaken. There are many reasons for this split and I’ll try to get to all the ones I can think of in coming days, but here’s one of my favorite, presented in a slightly complex, but hopefully intelligible way. The figure below plots the unemployment rate since the 1950s against a construct called the NAIRU—it’s the flat line, and it’s an acronym that stands for the lowest unemployment can go without triggering runaway inflation. You don’t have to buy the concept to agree with the analysis, though you should know that the NAIRU, as calculated by the Congressional Budget Office, moves around over time a bit to adjust for things like an older workforce. Typically, unemployment will wiggle around the full employment level, below it for a while in periods of strong growth and visa-versa. When unemployment hugs the line, we’re close to full employment, a very good place to be. The last time we hung out there for a while, in the latter 1990s (actually, we were below the line for a while) wages and incomes of the middle class actually tracked productivity, at least for a New York minute (and, for the record, inflation did not accelerate—but that’s another story). But here’s the problem: we used to spend a lot more time below the line and a lot less above it, and in those days, middle-class incomes tracked productivity. This figure simply sums up the percentage points above or below the line over the periods when middle-class income rose along with growth and when they did not. Over the period when growth and incomes were linked, we were 60 percentage points below the line, meaning labor markets were generally very tight. When growth and income became delinked, we spent over 100 points above the line, signaling weak job markets, high unemployment, jobless recoveries, and therefore much diminished bargaining power for middle- and lower-income workers. There’s a lot more to this story and I’ll try to stick with it. But the moral of the story, as the latter 1990s showed (that NY minute I referred to above), in today’s global, low-union world, the working man and woman really have no better friend than full employment. It’s one of the only and best ways I know to relink growth and middle-class prosperity. And we’re currently nowhere near it. Share the post "Slack Attack!" 29 comments in reply to "Slack Attack!" I’ve long argued that high unemployment is a useful feature for the corporate world, as it lowers labor costs due to employees’ reduced bargaining power. The attacks on the social safety net, unions, etc. serve this purpose. High unemployment may reduce demand and weaken the economy, but lower labor costs are cash today, while the benefits of a stronger economy are speculative. Business profits, and equity markets, are doing very well, seemingly validating this approach. Given the political power of big business, it’s no wonder the political agenda is entirely focused on cutting spending rather than doing anything to increase employment. Interested in your response to this new right-wing meme going around that suggests the President blames the slow recovery on ATMs and the replacement of workers with automation and machines. It’s clearly a crude caricature of a quote taken out of context, right? See Russell’s WJS op-ed (http://online.wsj.com/article/SB10001424052702304070104576399704275939640.html?KEYWORDS=milton+friedman) and some of the Fox News coverage of a snippet from the president’s Today Show interview (http://nation.foxnews.com/president-obama/2011/06/14/obama-blames-atms-high-unemployment). Now to us with a brain, it’s a simple concept to understand. For a Conservative though, this is way too complex a concept. I wonder if this isn’t one of the reasons to cut Social Security. If people can’t retire, they have to stay in the labor market, and the boomer retirements will reduce the number of potential workers a lot. This is called the Lump of Labor fallacy. It is alternately used to argue for earlier retirement and tighter immigration policy. All the evidence suggests it is completely wrong; the fraction of older workers in the labor force is positively correlated with the fraction of younger workers in the labor force…in other words, when more old people work that improves job prospects for everyone else rather than “taking jobs from young people.” Same story with immigration; more immigrants working means more non-immigrants working, not the reverse. This makes a lot of sense if you frame it slightly differently. Would you really argue that it is better for our country’s economy to have a person (ANY person) not do anything, vs. having them do productive work that grows our economy? No, you wouldn’t. But that’s what you’re saying when you suggest we’d be better off with more retirees or fewer immigrants. I agree, as far as this goes. But ask the question: does high unemployment “cause” lower wages, or are both only symptoms for which there is another cause? The answer should be obvious. High unemployment doesn’t “cause” lower wages – they’re both symptoms. But of what? High rates of foreclosures. Low household savings rates. Lack of demand. All symptoms, none of them causes. When productivity has gone up 80% since 1979 but wages only 11%, there’s got to be some set (not at all necessarily just one) of causes. Symptoms are not causes. Creative destruction. The factor of production IT replaces is human labor itself. It devalues labor. I’ll keep repeating it until someone takes it seriously. I’m not a Luddite, but I am a socialist. I feel like I go into Howard Beale mode every time that I come to this site. I think the graphs tell part of the story of ‘globalization’. When capital has no constraints on its flow, when capital is given every tax code and accounting advantage, then humans become too messy and expensive to employ. It’s simpler and easier to pay for voice mail in a digitized, networked world than it is to pay a human being to answer a phone. Plus, what kind of tax breaks do you get for employing a human (who requires health care benefits, retirement, etc)? Humans get too complicated and messy. Also, American humans become too expensive in a digitized, networked world (unless they fit certain niches, like hair stylists or genome researchers). Still, where did those productivity gains go? What were the accounting and tax structures that made it simpler and easier to pay for voice mail, and then book those ‘productivity gains’ onto a manager’s bonus (or a cascade of them) while downsizing the phone receptionist? In other words, why did ‘capital’ become valued so much more highly than humans? Because post 1979, ‘capital’ had the advantages of tax code and accounting changes. Then again, capital is much simpler and easier to work with than actual humans, who tend to be complicated, sometimes cranky, and often unpredictable. How did the culture come to worship capital over every other criteria? To me, those graphs are simply the fallout of what happens when an abstract tool, like ‘capital’ that was originally created from the inventive minds of humans, comes to dominate its human creators and drive their methods of thinking. Great post. Without tilting too much at a straw man, I think this is another example of how “the free market” really is influenced a lot by rules and institutions. As an oversimplification, rules and institutions which tilt the balance in favor of labor tend to be characterized as interference, while rules and institutions which tilt the balance in favor of capital are often glossed over, overlooked, or justified on economic grounds. GDP is a useful metric, it isn’t an end in itself. Perhaps it would be insightful to have things broken down by sector. Someone at one of the Feds did a breakdown of the losses to different industries due to globalization, which mainly affected manufacturing, I believe. I’m sort of thinking along those lines. This is not directly relevant to your argument, but it’s not completely off topic either, and you may like the link. I don’t know if you read this blog. This post offers a sort of overarching view of things, but he uses global manufacturing PMI among other metrics to illustrate the point. Hugh is great, but I don’t entirely agree with this argument. He argues that the bumps, “twin peaks,” correspond to the timing of quantitative easing, which he argues has had an effect globally. One may see this as a good thing or a bad thing. From one perspective, that’s far reaching; from another perspective, that’s far too diffuse, which makes it potentially dangerous. I guess I really don’t have too much faith in QE, and thus I’m not particularly disappointed in terms of the Fed’s substance. I do think the Fed could infuse a bit more urgency into the dialogue, but with the rabid Republicans barking at its door, it probably feels it’s better to keep silent or safe. I do think that all this emphasis on positive reinforcement, trying to get people to do what you want based on offering incentives, is too simplistic and doesn’t leverage policy tools in a balanced way. and as I mentioned earlier, an increase in the capital gains tax. I think using taxes as a tool for getting the economy back on track has been under-appreciated because it’s often viewed as contractionary. I would argue that this is simplistic. I was all for the extension of the middle class tax cuts. However, there is little expansionary benefit in giving tax cuts to the wealthy. Taxes are a very useful way of directing people’s behavior, and yet they are generally used only as an incentive, lowering them, not enough as a disincentive. I would also like to see more fiscal expansion. In fact, if someone gave me the choice between more QE or infrastructure and R&D spending, I would rather see the latter. I think it’s more beneficial and has less risks. And in this political environment, QE seems to inspire as much Republican (and public) ire as fiscal spending, which makes me think that waiting for the opportune moment to push for more fiscal spending might be a better strategy than exhausting any remaining political capital (we might actually be in deficit territory) for something that seems to offer marginal economic gain. Hugh makes this extremely important point, “this whole situation has morphed in people’s heads into a public sector indebtedness problem.” People are conflating the solution with the problem. Congress is failing the American people because Republicans dominated the message and corrupted impressionable minds with their economic nonsense. I don’t think it’s fair to say that the Fed is spineless when it has tried two rounds of QE and rates are at the zero lower bound. The Fed has practically single-handedly propped up the western economy for the past two years. The ECB is almost working against the Fed. I know this is a contrarian perspective for the liberal blogosphere, but I don’t care. Frustrations are running high, but Bernanke has been the one saving grace for awhile (and yet he’s come under all kinds of criticism from the right and the left), and I don’t see how castigating the Fed right now helps. It’s sort of how I felt after Obama got Osama. I realized that it’s very easy to complain, and although I do feel that many negotiations were terribly botched and that’s quite annoying (very annoying unforced errors), Obama has a lot more to deal with than just domestic policy, and he’s had some major domestic accomplishments. The event forced things into perspective for me. And I think the left could use to keep the Fed in perspective too and start looking for some creative solutions, especially ones that can sidestep political gridlock. Anyways, there it is — a mess of thoughts on some issues of the day. (Sorry for the piecemeal…. I just read the article) Or something like this too. That’s a good way of reviving our manufacturing industry. It’s so frustrating to me that Republicans oppose good ideas. One may think they want the economy to fail just so they can win back the White House…. Hm. Thanks for returning to this issue, Jared. A link to a BLS paper that I cited before showed that the gap was greater in years in which Republicans controlled the Administration and less in years in which Democrats did. I’m still trying to figure out what Republicans actually do to widen the gap while they’re in power. Knowing this could perhaps help develop countervailing policies to narrow the gap. 1) Automation: more is invested in automation than workers. I would guess a modern McDonalds if very productive but that stems from nearly idiot proof automation, not high skilled workers. 2) Outsourcing: If a company makes widgets and switches from one source of parts to a much lest costly Chinese source all of a sudden the workers are more productive without doing anything at all different. It seems like, in very simple terms, we should, as a society, be willing to accept slightly higher inflation over the long term (and even the risk of brief accelerations, which can be easily stamped out by the Fed), in exchange for a stronger middle class and a weaker plutocratic rentier class. This seems obviously-good for the VAST majority of Americans. And yet we have lots of middle class people who fret about inflation, and demand replacement of the Fed with a brain-dead gold standard. It’s ridiculous. Isn’t this a circular or trite answer? You are trying to explain why increases in productivity did not lead to higher median family income, and the explanation is basically that unemployment was too high (relative to NAIRU, which is basically a straight line). This is the equivalent of saying that median income is going down because we are experiencing jobless recoveries. I think these numbers are interesting, but they do not explain what is going on. You tip toe all around what you are looking for, yet you refuse to look at it. Take the fortune 500 companies. Create a spreadsheet showing how many employees they have in each country. Or look at these two articles. Whether you want to believe in the good of Corporate America or the Greed of Corporate America is a problem that I cannot help you with. But I can guarantee you that if you go down this path, you will find the answers you seek. I thought of a coulda that will appeal to both sides and have a very fast impact on jobs. Make a repatriation offer they can’t refuse. Allow foreign funds a tax free return to the United States at zero tax if that money is offset by the cost of hiring and keeping an employee for one year. They don’t pay back taxes on the money coming in, they don’t pay future taxes because the expense of the new worker. It’s like a 50% off offer. Hire one get one free. Loss of bargaining power for workers due to high unemployment is certainly one factor. We don’t have to go back very far in the time machine to remember the hiring incentives for tech workers in the late ’90’s (BMW X3’s at a local company). Several comments have danced around this, but I would look closely at tax policy as another factor. High marginal rates on income and dividends discouraged corporate owners and stockholders from keeping the gains from productivity when investing back in their company may have a better return. I don’t know (obviously) but tax rates and disconnect between productivity and wages is clearly concurrent if not causal. Is there any way you can post your dataset? I’d love to play, too. Washington D.C. – With the unemployment rate at a painfully high 9.1 percent, the majority of Americans list jobs as their number one economic concern. A new report from the Center from Economic and Policy Research (CEPR) suggests that in the current economic climate work sharing may be the most effective way to avoid many layoffs and quickly return the economy to full employment with little additional spending. The report, “Work Sharing: the Quick Route Back to Full Employment,” describes a system of work sharing that would give employers an incentive to keep workers on their payrolls with shorter hours as an alternative to laying them off. This would be attached to the current unemployment insurance system with short-time compensation as an alternative to unemployment compensation. Work sharing is a practical, but underutilized, policy option here in the United States. Senator Jack Reed (D-RI) plans to soon reintroduce legislation along these lines to incentivize work sharing domestically. In addition to most nations in the Organization for Economic Cooperation and Development (OECD) having some experience with work sharing, 21 states in the United States already have work sharing programs in place. While recognizing some implementation issues could be addressed to make it more attractive, the report presents hypothetical take-up rates and the likely impact of work sharing on productivity in the United States. Perhaps due to a misplaced focus on deficits rather than jobs, the U.S. economy remains weak and growth is tepid at best. With threats of a possible double-dip recession and more rounds of layoffs looming, work sharing may very well be the most economically and politically viable means of lowering the unemployment rate. When European countries thought they would have double digit unemployment forever in the 70’s, work sharing was one of the correctives tried. Unemployment rates did come down over time and we even got to where the French had a higher GDP per hour worked than the US in 2007. I don’t know the ins and outs of their experience, but if it worked there, I would certainly try it here. As our natural resource wealth extraction per person has come more in line with European countries, our economies have become more similar. A wise man learns from others’ mistakes; a fool, not from his own. 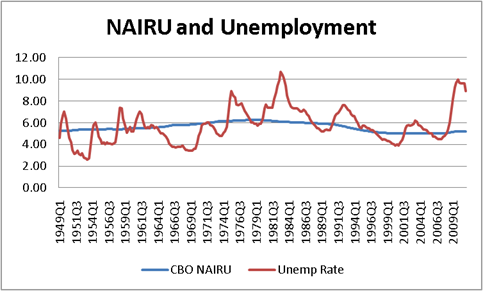 From 1949 through 1974, the actual rate of unemployment was generally considerably below the NAIRU. How can it be called a “natural rate” when for 25 years it most decidedly was not the natural rate? I’ve always suspected the NAIRU is bullcrap — sure, a theoretical construct that makes sense, but really a self-serving number dreamed up by economists for corporate interests and policy-makers who share an interest in suppressing labor. Once again: how can it be a “natural rate” when it’s wrong over a 25 year period? 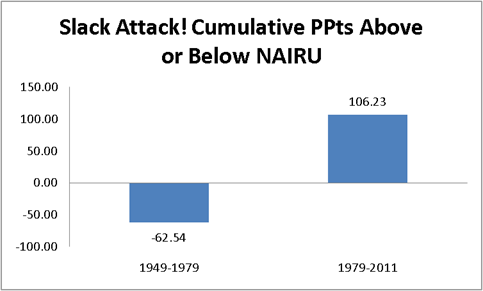 urban legend, your suspicions are borne out by Jamie Galbraith’s wonderful “Time to Ditch the NAIRU,” published in the Journal of Economic Perspectives in 1997. This essay presents a brief for no-confidence, in four parts. First, the theoretical case for the natural rate is not compelling. Second, the empirical evidence for a vertical Phillips curve and the associated hypothesis that lowering unemployment past the NAIRU leads to unacceptable acceleration of inflation is weak, and has become much weaker in the past decade. Third, viewed collectively, attempts to estimate the location of the NAIRU have become a professional embarrassment; disagreements remain on too many basic issues. Fourth, adherence to the concept as a guide to policy has major costs and negligible benefits. Conversely, the risks of dropping the natural rate hypothesis are minor, while the benefits from a sustained pursuit of full employment could be substantial. Given the projections for long-term, mass unemployment, does this mean it’s likely to keep getting even worse? Also, does it mean that business has a disincentive to end mass unemployment? Does this terrible economy not only help the creditors (and here I’m referring to Paul Krugman on Rentiers), but also business? Another very significant factor is that families simply ran out of things to spend money on. Increasing productivity for products with a large base of users translated into higher profits, and one of the only ways for that money to leave the wealthy was more service occupations for things not deemed as essential as everyday life. With a lower utility to cost ratio for the average family they have seen less use by the middle class and more by the wealthy and corporations. Furthermore, given that GDP is roughly linear to energy consumption in a given economy, there is no assurance even current median income levels will be sustainable in the future. This is the appropriate blog for anybody who wants to find out about this topic. You understand a lot its virtually onerous to argue with you (not that I actually would need…HaHa). You definitely put a new spin on a subject thats been written about for years. Great stuff, simply great! Wow, the rabid Douglas Eeeeeeeeeeeeek-n is still at it. I watched you and he on Rev AL’s show and was sadly less hopeful of anyone on the right having the brain cells to even learn the facts before they speak. I guess this is how it will be until 2012 elections. Well, not that I agree with everything our president has done and I too want to see some more fight in him I can tell you this. I will vote for President Obama again in 2012 and shove my proud vote up the behinds of whoever is running on the right. If we are forced to keep choking on a do-nothing republican congress then I will do my part and vote for the only guy who most of the time does care about this country. If I am to understand the dynamics of the right holding ALL of us their hostages to gain a win, I will not partake in that and cast my vote for Obama. Thanks Jared for always keeping with the facts. But how do marginal tax rates and wealth concentration map onto this chart? What is the mechanism by which higher incomes from increases in productivity get back to workers? Looks to me like the only routes back to workers are lower prices and the increased demand generated by redistribution through taxes. But why would a monopolist or an oligopoly reduce prices? If you increase monopoly profits and decrease taxes, all of the gains go to savings accounts of the wealthy. If they don’t spend it all and invest a lot overseas, increased income from productivity gains generates income in other countries and increased asset prices of things rentiers like to own. I think this what Keynes was trying to tell us. The increased income has to get back somehow to those who will increase their spending and thereby increase the income of others. Wealth concentration works against this. It prevents the additional income from getting to those who will increase their spending. Overall income is lower & total capital is lower. But, if you’re a rentier, why should you care what everyone else’s income problems are? Has anyone ever refuted Keyne’s explanation of how this works or do they just dislike it because it doesn’t serve their purpose? Maybe we need to change the name of the academic study of economics back to moral philosophy and leave the profitable business of economics called economics; like consulting or public relations, not so much an area of study as profit generating business. This way economists would have to choose which side of this divide they want operate on and the public wouldn’t be so confused. We could even have a separate SIC code for the Supply Side BS Industry.